A loan of $400 helped to buy fruit to sell on buses. Fátima is an enterprising 21 year old who only studied up to Grade 5 due to her family's economic problems. She is now in a common-law relationship. Her partner works as a bricklayer and they have a young daughter. Fátima sells sweetbreads and French bread that is made by a bakery. She does this daily and she also sells soft drinks at a bus stop. She decided to do this work as she needed to raise her child and provide sustenance for her. Fátima's mother is also involved in this work. She works from 6 am until 4 pm. The loan is needed to expand the business, buying fruit to sell on the buses. Doing this she will have more economic income and can provide what is needed for her child. 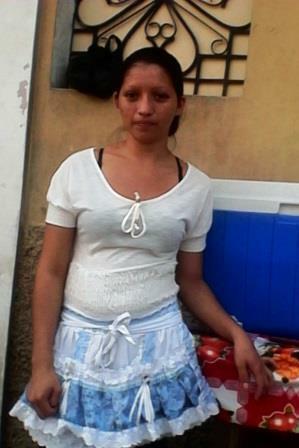 Fátima's dream is to continue with her sales and have her income improve every day. Fátima es una joven emprendedora de 21 años de edad, estudió hasta 5º grado debido a los problemas económicos de su familia, ahora ella está acompañada, su pareja trabaja de albañil y tienen una pequeña hija. Fátima se dedica a la venta de pan dulce y pan francés que elabora una una panadería, esta actividad la realiza todos los días y también vende refrescos en una parada de buses, ella decidió dedicarse a este trabajo debido a la necesidad de sacar adelante a su hija y darle lo necesario para el sustento, en el trabajo de Fátima se involucra su madre y lo realizan en un horario de 6:00 AM a 4:00 PM. El préstamo lo necesita para incrementar su negocio, comprará frutas para vender en los buses, de esa forma tendrá más ingresos económicos y podrá darle lo necesario a su hija. El sueño de Fátima es seguir con sus ventas y que sus ingresos mejoren cada día. This loan is part of a project to help young men and women in El Salvador (under age 26) launch their own businesses. The field partner is reducing the guarantee for these individuals, who normally would not have access to loans due to their lack of experience. Unemployment for young people is high in El Salvador, a fact that motivates many of them to leave the country instead of searching for work. Aside from access to financing, clients will also be grouped together according to their business types to receive training from CrediCampo's social development unit, and to share advice and support with one another.